Frankly assessing the opportunities and obstacles in church leadership for women, the essays are accompanied by study data from the Lead Women Pastors Project, carried out by Park, GBHEM’s director of Clergy Lifelong Learning, and Willhauck, associate professor of Pastoral Theology at Atlantic School of Theology. Among the study’s intriguing findings: The denomination’s 100 largest churches are still led by male clergy; women clergy serve more preliminary appointments than men before leading a large congregation; and large churches led by women report higher membership numbers and worship attendance. Willhauck said the essay collection is an extension of the work begun by the Lead Women Pastors Project in 2008. “Through interviews, a survey, retreats and online dialogues, we learned how women are leading big churches in increasing numbers with grace and aplomb, setting an example for pastoral leadership in The United Methodist Church, indeed shattering the glass ceiling,” Willhauck said. Retired Bishop Violet L. Fisher praised the book’s use of qualitative research to support the insights of the essayists. “These lead women pastors call us to confront our own preconceived notions of what it means for women to be created in the image of God and gifted to lead large congregations,” Wilson said. “The editors and contributors speak honestly with wisdom and candor, offering encouragement and insight to their sisters — and brothers — in Christ as we serve God’s church in the 21st century,” Warner said. The editors and essayists together make a convincing case that sharing stories and supporting one another’s pastoral leadership roles through educational and coaching resources can help empower women working in large churches. “I believe this project will help the church raise up a new generation of women leaders for such a time as this,” Willhauck said. 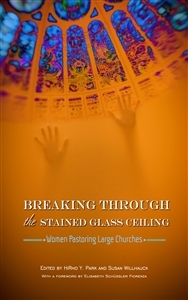 "Breaking Through the Stained Glass Ceiling: Women Pastoring Large Churches," available as an e-book only, can be ordered online through Cokesbury, Amazon, Barnes & Noble, and iTunes at http://bit.ly/17BgWiS. -- Renee Elder is a freelance writer and journalist in Raleigh, N.C.